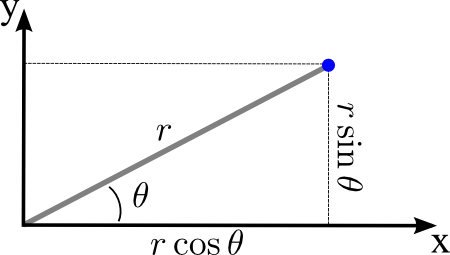 In two dimensions, the Cartesian coordinates $(x,y)$ specify the location of a point $P$ in the plane. Another two-dimensional coordinate system is polar coordinates. 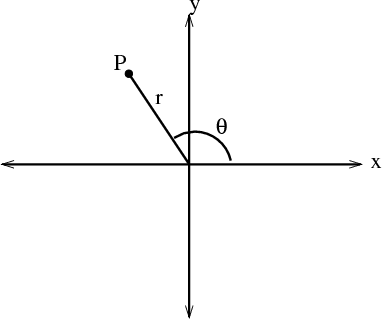 Instead of using the signed distances along the two coordinate axes, polar coordinates specifies the location of a point $P$ in the plane by its distance $r$ from the origin and the angle $\theta$ made between the line segment from the origin to $P$ and the positive $x$-axis. The polar coordinates $(r,\theta)$ of a point $P$ are illustrated in the below figure. As $r$ ranges from 0 to infinity and $\theta$ ranges from 0 to $2\pi$, the point $P$ specified by the polar coordinates $(r,\theta)$ covers every point in the plane. Adding $2\pi$ to $\theta$ brings us back to the same point, so if we allowed $\theta$ to range over an interval larger than $2\pi$, each point would have multiple polar coordinates. Hence, we typically restrict $\theta$ to be in the interal $0 \le \theta < 2\pi$. However, even with that restriction, there still is some non-uniqueness of polar coordinates: when $r=0$, the point $P$ is at the origin independent of the value of $\theta$. The following applet allows you to explore how changing the polar coordinates $r$ and $\theta$ moves the point $P$ around the plane. You change the polar coordinates using sliders and observe how the point moves in the Cartesian plane. You can also move the point in the Cartesian plane and observe how the polar coordinates change. Notice the non-uniqueness of polar coordinates when $r=0$. Polar coordinates. When you change the values of the polar coordinates $r$ and $\theta$ by dragging the red points on the sliders, the blue point moves to the corresponding position $(x,y)$ in Cartesian coordinates. Alternatively, you can move the blue point in the Cartesian plane directly with the mouse and observe how the polar coordinates on the sliders change. The coordinate $r$ is the length of the line segment from the point $(x,y)$ to the origin and the coordinate $\theta$ is the angle between the line segment and the positive $x$-axis. What about the point where $(x,y)=(0,0)$? In this case, the angle $\theta$ isn't well defined. You could just take it to be $\theta=0$ to be concrete. In the above applet, we represented polar coordinates by two separate points on a $r$-axis and a $\theta$-axis (the two sliders). We could also put those two axes together into a single $(r,\theta)$ plane (just like the $(x,y)$ plane of Cartesian coordinates). This simple change of representing the polar coordinates as a single point on the polar $(r,\theta)$ plane is reflected in the following applet. Such a slight shift in perspective has more consequences than you might imagine, as you can read about in a page about polar coordinates as a mapping from the $(r,\theta)$ plane to the $(x,y)$ plane. Polar coordinates with polar axes. The red point in the inset polar $(r,\theta)$ axes represent the polar coordinates of the blue point on the main Cartesian $(x,y)$ axes. When you drag the red point, you change the polar coordinates $(r,\theta)$, and the blue point moves to the corresponding position $(x,y)$ in Cartesian coordinates. Alternatively, you can move the blue point in the Cartesian plane directly with the mouse and observe how the polar coordinates represented by the red point change. The coordinate $r$ is the length of the line segment from the point $(x,y)$ to the origin and the coordinate $\theta$ is the angle between the line segment and the positive $x$-axis. Polar coordinates by Duane Q. Nykamp is licensed under a Creative Commons Attribution-Noncommercial-ShareAlike 4.0 License. For permissions beyond the scope of this license, please contact us.